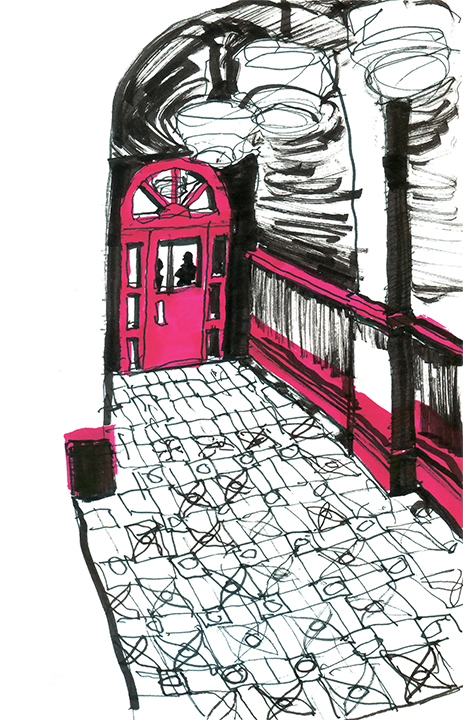 Drawn within the confines of Halifax Provincial Court, my second home the past few weeks, where I have been sketching the goings on. Here another world exists: the haunt of judges, clerks, crown prosecutors, defence lawyers, sheriffs, the innocent, and the guilty. Next post; Behind the doors of courtroom#1. This entry was tagged courtroom drawing, Halifax, Nova Scotia. Bookmark the permalink. Thanks t.i.l, I attribute the swirliness to slight state of delirium. Hope your summer starts warming up, Russell. Russell, ‘ave you been nicked? No, not yet anyway. Russell. What are you doing with all of these court room drawings? Hello Magill, thought I’d try to break the convention of the usual pastel courtroom drawings. Court is one of the few places where cameras aren’t allowed, there’s so much going on, and plenty of characters. Russell. Yes, it can be quite a grim place, a sense of humour is a prerequisite of working there. Russell.